Rider Kielan Woods is hoping to capitalise on a surprise first success at the Cheltenham Festival last week and has set his sights on breaking the 30-winner mark for the first time this the season. The 26-year-old feared a maiden festival win might never happen, but any trepidation was laid to rest thanks to Croco Bay's bold success at 66-1 in Friday's Johnny Henderson Grand Annual Handicap Chase. Despite spending much of the weekend watching replays of his landmark victory, Woods was still struggling to fathom his Grand Annual heroics on Monday, when he was well beaten on his only ride at Southwell. "I promise you, I can still barely believe it," said the rider, with 24 winners to his name for the season. "It's been class since Friday; just unreal. I've watched it about 50 times and it's just about sunk in. "All my family were there, which I was delighted about and, while Friday night was quiet with me riding at Kempton on Saturday, we gave it a good go on Saturday night." Despite finishing third on Croco Bay in the same festival race in 2015, Woods was as surprised as anyone that the 12-year-old rolled back the years to score an unlikely success for owner Lady Grosvenor and trainer Ben Case. "I led down to the last on him the Grand Annual before and got swallowed so I wasn't confident until I crossed the line," added the rider. "At the start of the week we didn't think he'd get into the race and two weeks ago I didn't even think I'd have a ride at Cheltenham, so it was unbelievable. "I've ridden at the last six festivals and when I finished third on him I thought that might be as good as it gets. I certainly didn't think at the age of 12 he'd come back and win." 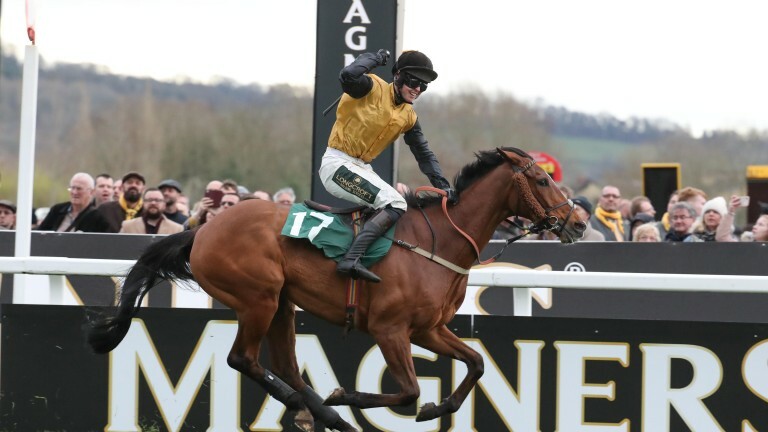 Originally from Athlone in central Ireland, Woods is in his ninth year based in Britain and closing in on 200 winners, although his career has been plagued with a series of serious injuries, including fractures to his hip, pelvis, both collarbones and leg. Having been sidelined for a spell last year, Woods has made the most of an uninterrupted run through the core jumps season and is on the cusp of his best seasonal tally. He hopes Friday's success can propel him to the next level in his career. "Hopefully it pushes me on," said Woods, stable jockey at Graeme McPherson's yard in the Cotswolds and based nearby in Bourton-on-the-Water. "It's been a great season, although I missed a fair few winners for the boss in the summer through injury. I'd love to get to 30 winners - I broke my leg one year when I was on 28 and was gutted. With a month to go I'd be delighted if I could get there."